Find your favorite Christmas crafts for kids here! Christmas is the perfect time to make memories and create keepsakes, and when you invite the kids to craft with you, you can do both! There are so many Christmas crafts for kids in our free eBook, 11 Christmas Crafts for Kids to Create. Choose from a variety of homemade Christmas ornaments, edible ideas, and paper projects that will satisfy a child’s urge to create. Christmas Crafts for kids is a great way to bring the family together. 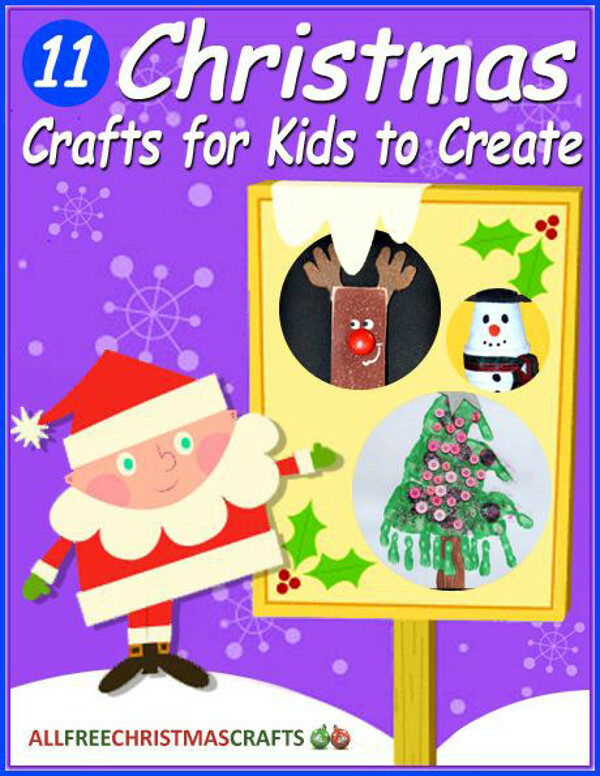 Download your copy of 11 Christmas Crafts for Kids to Create today! The holiday season is the perfect time to connect with the family. While it’s fun to visit the mall or take a trip to a local store, there’s something special about bonding with your loved ones at home. Crafting is a fun and easy way to foster creativity, pass on traditions, and instill confidence in children. Whether you want to keep an older child busy after school or teach a toddler how to identify shapes and colors, you’ll find a project that suits your needs in this collection. Popular Christmas characters like Rudolph and Santa can be found in these pages, along with fun surprises like an adorable Elmo ornament. Decorate your space, send personalized thank you notes, and eat up! You can’t go wrong when you teach your kids about winter and Christmas through crafting. Nest Ornament (pg. 5) – Let your kids get a little messy as they make this project with clothespins and green paint. For a personal touch, have your junior crafter dictate a Christmas message that can be attached to the ornament. This easy ornament craft makes a great gift for Grandma. Elmo Ornament (pg. 7) – Learn how to make Christmas ornaments inspired by characters that your kids know and love. This project doesn’t require boxes of expensive materials; like the best Christmas crafts for kids, this tutorial calls for simple items like cotton balls instead. Edible Snowflake (pg. 11) – Let it snow in your kitchen! Easy Christmas crafts for kids involve very few steps. 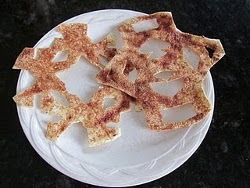 For this project, use tortillas and cheese to create your own snowflakes that look and smell delicious. This project is great for children who are old enough to use scissors on their own. The best part? If your child makes a mistake, she can just eat the evidence and start again. Handprint Christmas Trees (pg. 14) – Capture a moment in time with this adorable Christmas tree craft for preschoolers. Kids will love covering their hands and feet with paint. 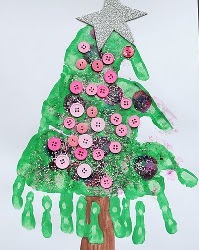 Once they’ve made their mark, allow them to decorate the tree with paper scraps, buttons, glitter, ribbon, and more. Quick Crafty Christmas Cards (pg. 15) – Use Christmas crafts for kids as a chance to teach your children about the power of gratitude. This project requires some help from Mom and Dad, who use a circular punch to make shapes out of decorative paper. 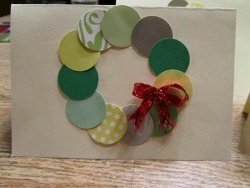 Then, the kids can pick their favorite punches to fashion a wreath on the front of a card. 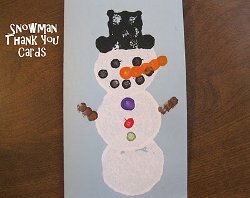 Snowman Thank You Card (pg. 17) – For a super easy, budget-friendly project, look no further than this adorable snowman card. You don’t even need a stamp to create the frosty friend on the front of the card. Make easy Christmas crafts for kids like this one using recycled items like thread spools. Q-tips are the perfect tool for adding eyes and buttons. There are so many ways to help kids get creative during the holiday season. No matter what their age, children have the urge to create and show off their skills, so let them explore those interests this winter. Together, you can make homemade Christmas ornaments, cards, and more. This year, start an important tradition and bring the family togetherfor an afternoon of easy Christmas crafts for kids. Two weekly emails with free Christmas projects, tips, collection pages and more. Access to our free pattern library full of 1000’s more free patterns and tutorials. Keep your tykes entertained this holiday season by downloading 11 Christmas Crafts for Kids to Create now–it’s free! Subscribe to receive our newsletter Crafty Christmas Ideas, and you'll receive kid-friendly crafts and activities in your inbox every week. You have no idea how this book has helped me thru the summer and is still helping me. I babysat my grand kids multiple times over the summer and each time they would ask what they could make. This has so many cute,easy and inexpensive for them to make. They were looking forward to each visit and so was I!